It appears to be criminal treatment in the sense of it being severe physical treatment and also psychological in the sense that he is being forced to listen to other people apparently being tortured,” Taylor said. She called the footage evidence of an“international crime, crime of torture and cruel and inhumane treatment. At one point Gaddafi asks for a rest telling his captors that he will cooperate. “Don’t. I will tell you all the information you want,” the man, who is yet to be verified as being Gaddafi, says in the video. At one point in the video Gaddafi tries to reason with the interrogators to stop the abuse. Human Rights Watch (HRW) meanwhile called on Libyan authorities at the al-Hadba facility in Tripoli to “immediately investigate” the apparent ill-treatment of detainees, as it called to suspend the guards involved in the “questioning.” “The graphic video that seems to show prisoners being beaten raises serious concerns about the methods used to interrogate al-Saadi Gaddafi and other detainees at al-Hadba prison,” said Joe Stork, deputy Middle East director. “No exceptional circumstances justify torture or other ill-treatment.” Meanwhile, Libya’s state prosecutor has started an investigation and is seeking to identify the guards in the video. 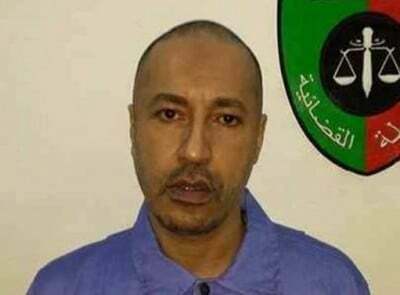 The release of the video follows last week’s verdict in the cases of 32 former Gaddafi officials, nine of whom were sentenced to death, including another son of Muammar Gaddafi, Saif al-Islam Gaddafi. The remaining 23 former officials received between five years and life in prison. The mere fact that Saadi has a Gaddafi name will mean that he will be subjected to the same treatment,” Taylor told RT, calling it a “collective punishment.